Our Moses Gate Church, Walkden Circuit, has suffered heavy losses through the War, some of its most promising young men having made the supreme sacrifice. Among the number is Sergt. J. Balshaw, who fell in France in July, 1918. He was one of the first to respond to the call and volunteered in August, 1914. Very few even of our boys have passed through such strange and varied experiences. After training he was drafted out to France, where he was wounded and sent back to England. On recovery he served in Egypt, German East Africa and Palestine. Then back to France, where he paid the great price. From infancy he has been connected to our school. He had a beautiful voice, which was used in our choir. He was a splendid type of manhood and built on noble lines. He had a fine mind and excellent power of expression. He leaves a fragrant memory. Much sympathy is felt for the family. James was Sergeant 3342 in the Loyal North Lancashire Regiment, 2nd Battalion. 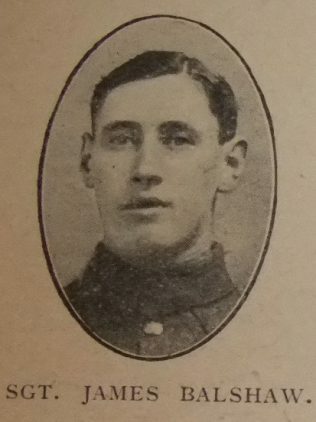 He was killed in action on 23 July 1918.